The Royal Air Force Aerobatic Team are due to be presented with Bailiff’s Silver Medals next week in honour of their commitment to the Island. Mike Higgins, the organiser of the Jersey International Air Display has been trying to organise the reception for a number of years and now it will take place this year at Government House. 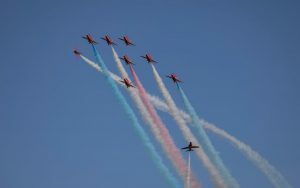 The Red Arrows are due to arrive in Jersey Wednesday 12 September.